DESPITE the large and ever-increasing electrically-operated track mileage on the Southern Railway, that railway still has need of powerful express steam locomotives. To work the express steam trains on its system the Southern Railway has built several classes of locomotive, including two of the 4-6-0 type, the King Arthurs and the Lord Nelsons. The largest Southern Railway 4-6-0s are four-cylinder simple engines of the Lord Nelson class, named after famous admirals. No. 850 Lord Nelson, which appeared in 1926, was followed by fifteen similar locomotives, numbered 851-865. In 1937 No. 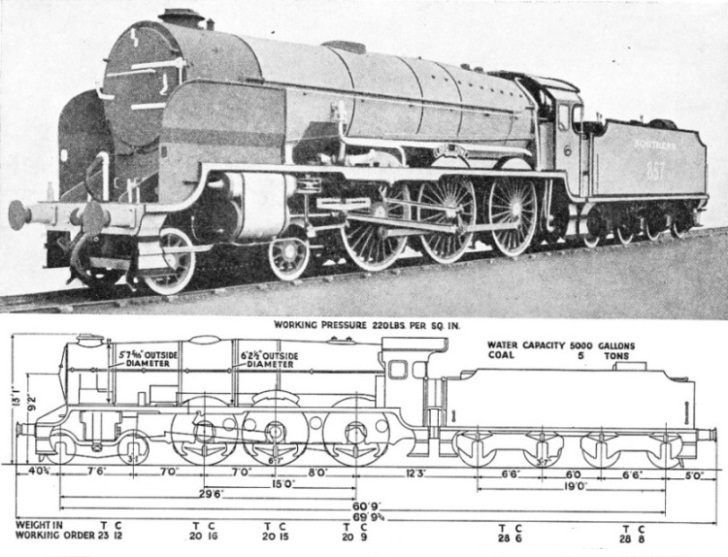 857 Lord Howe - illustrated above - was rebuilt with an enlarged boiler having a round-topped firebox. As originally built, these engines had boilers 14 ft 2 in long between tube plates and small tubes of 2 in diameter. The small tubes provided 1,359, the 5¼-in flue tubes 544 and the firebox 194 square feet of heating surface. The addition of 399 square feet of superheater heating surface gave a total of 2,496 square feet. The working pressure was 220 lb per square inch. The firebox was of the Belpaire type and the firegrate area 33 square feet. Tractive effort, at 85 per cent boiler pressure, was 33,500 lb. The fitting of a new boiler to No. 857 Lord Howe has considerably modified some of these dimensions. The heating surface and volume of the firebox have been increased by the addition of a combustion chamber extending into the barrel. The flue tubes and the firebox now have heating surfaces of 628 and 246 square feet respectively and that of the superheater 460 square feet. The provision of the combustion chamber has had the effect of shortening the length of the boiler between tube plates by 1 ft 2 in to 13 feet. The heating surface of the small tubes (now 1¾ in and 2 in) has consequently been reduced to 979 square feet. The total heating surface - 2,313 square feet, including superheater - is slightly less than before. A round-topped firebox has displaced the Belpaire firebox. The boiler pressure and cylinder dimensions (16½ in diameter by 26 in stroke) remain unaltered. The weight of the engine, in working order without tender, is now 85 tons 12 cwt, a slight increase on the original weight of 84 tons 16 cwt. That this increase has been no greater is largely due to the fact that the new boiler is built of 2 per cent nickel steel plates.